Piper had her Mother’s Tea last Friday, a few days after Ellie. It’s quite a different format in the toddler classroom than the primary classroom. 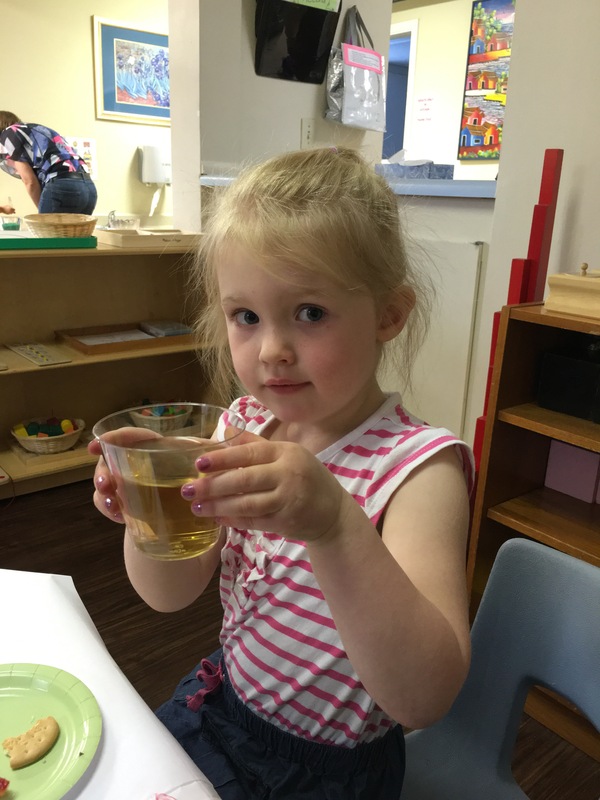 The kids helped the teachers make cookies with jam in them and they squeezed the lemons for the lemon tea. We sat on their tiny little stools and had tea with them, played outside in the water trough, did some work and then did circle time. The kids made us these adorable keychains with their pictures in them, which I hung in my car. 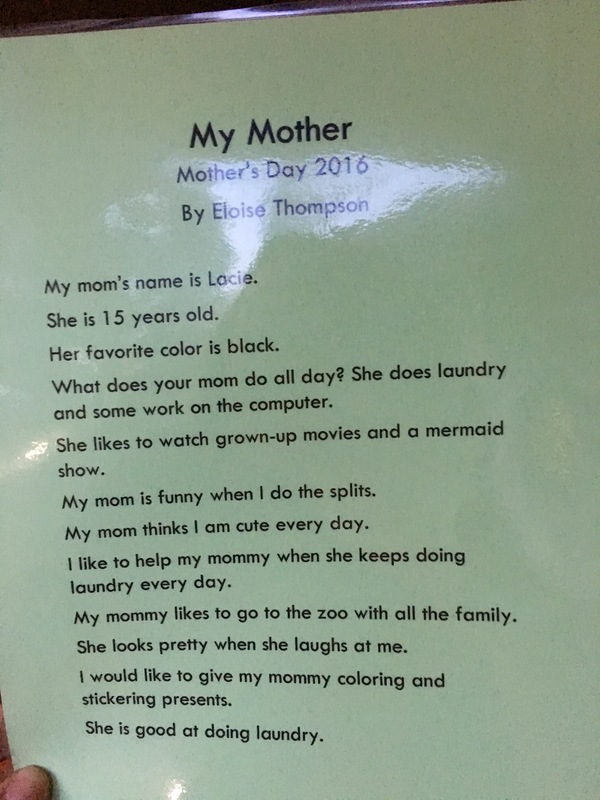 Tonight we had Mother’s Tea at Ellie’s school, an annual tradition that all of us moms (and dads) really love so much. It’s always quite a bit of effort to hold back the tears when they start singing “You are my sunshine,” etc. It is extremely sweet of all the teachers to work with the kids for weeks to practice songs to sing us, make us our sandwiches, our “about mom” papers, our corsages, and our gift. This year’s gift was soap; mine was purple of course, in the shape of a heart with tiny little seashells in it. It smells wonderful. The bag Ellie made for the soap has 3 little yellow stars on it. One of the other things I really love about Mother’s Tea is seeing all of the other kids and the other parents. It’s fun to see how unique everyone is and how they’re growing up. Today when I picked Ellie up from school so we could go get some dinner before Spring tea, one of her little friends was talking to me and when we were about to leave she told me she loved me…melt my heart! There is another little girl who has the most amazing style. I love her tie dye rainbow dresses and headbands. It’s fun to see Ellie in her element with her buddies as well and it’s great to see her treat her friends kindly and love them. Within a single year I grew 12 years older. That one actually does feel accurate. Somehow laundry grew exponentially in the last year. That one actually does feel accurate. My movie preferences changed from Frozen (which I’ve actually never seen) to “grown up movies.” Thank God I’m sure she means movies capable of being shown in theaters. My favorite color changed from blue to black. 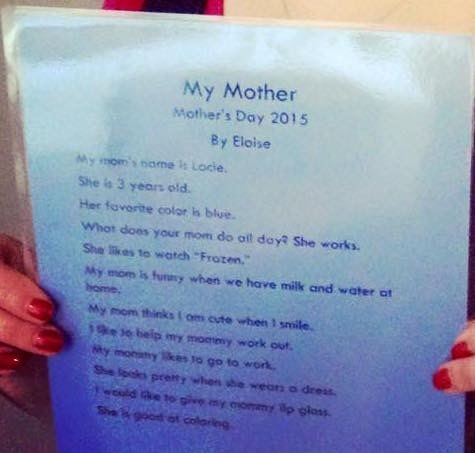 My hands down favorite thing about this year’s “about mom” card is that she thinks I look pretty when I laugh at her. That makes me so happy to hear because if that is her definition of beauty for the rest of her life I will be so proud. When Ellie was about one, I had to travel for work. I read a book called Carry On Warrior, which I also wrote about here. I distinctly remember a part of the book where the author talks about being in line at Target with 3 crazed children in the checkout line and some older woman looks at her and says something to the effect of “Treasure these moments, they go by too fast.” At that point I’m pretty sure Glennon (the author) was visualizing throwing a huge middle finger, while in actuality she smiled sweetly and held her breath. The point is, I’m starting to feel the need to treasure those moments now with the girls. Time is just continuing to go by faster and faster and I find myself even more frequently sitting in a moment and focusing so as to never forget it. 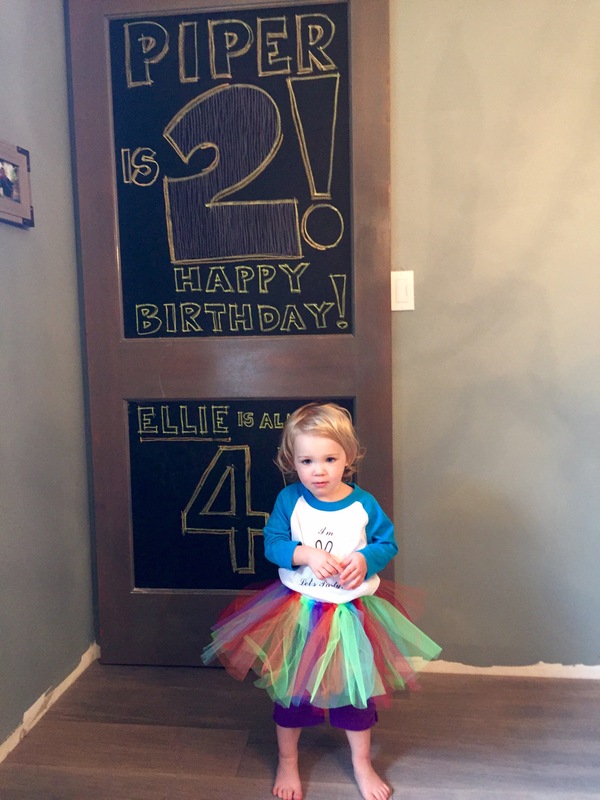 Ellie’s 4th birthday was exactly one of those times when I wanted to pause and never forget it. Although it was pretty busy and crazy, I felt like it slowed down a bit by me focusing on being conscious and present. Although I’m no princess fan, Ellie loves Rapunzel, so we threw a Rapunzel party. Luckily, my friend Niki had already thrown one for one of her daughters, so she shared her decor. 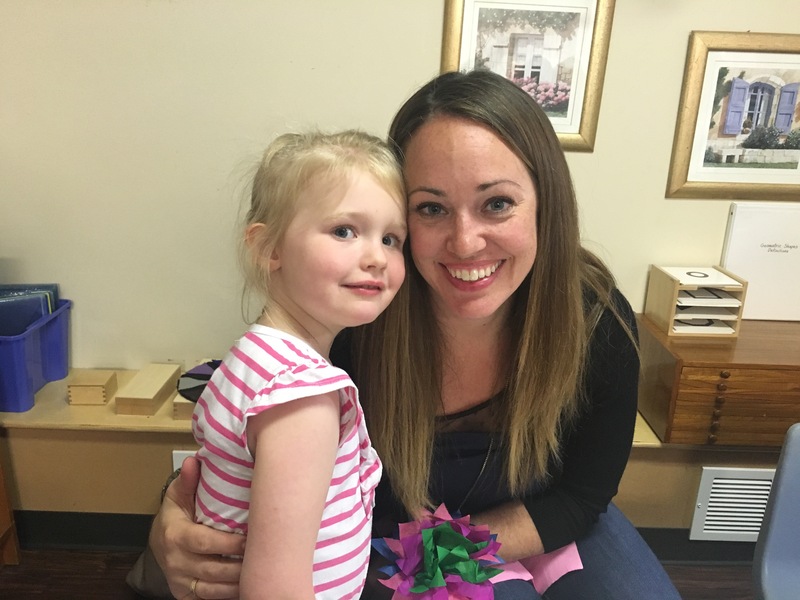 We hired a local company, Seattle Princesses, and Rapunzel herself came out to read, paint Ellie’s face and play with the kiddos. We also did a lantern decoration station since Rapunzel’s parents and townspeople sent them off every year on her birthday in Tangled. Photos are below and if you’re interested in doing the lantern decoration station or making your own Rapunzel party hats for your Rapunzel party, I’ve listed the items I bought from Amazon below the photos. I used fishing line to string through the led light and tied it to the inside of the lantern. I made braids with the yellow yarn and tied them off at the top and the bottom with the clear rubber bands. Then Brian stapled the braid to the inside back of the hats. The girls’ former teacher Ruoyun reached out to see if any families were interested in getting a free photoshoot with a photographer who wanted to expand her portfolio. I couldn’t help but take her up on it and I am so glad I did. Here is a link to the photographer’s Facebook page and below are the images – some are edited and some are raw. This year, Thanksgiving weekend was truly one for the books. It was a five day weekend for the girls, so the fun really started on Wednesday. Wednesday we made quite a few of the dishes for Turkey Day and for the first time in my life I made homemade gyros for dinner. I followed this recipe, which I found on Pinterest. Don’t believe it when they say they take 20 minutes, but they were pretty delicious. Our friends Heras and Parris brought their adorable little six month babe Weston over and once the kids went down to bed we had a good old time with some Cards Against Humanity. After that night, I couldn’t believe we made it up and out the door to run our traditional Issaquah Turkey Trot 5k. It was super freezing cold, but Grandy hung out with the girls and they cheered us on at the finish line. After the 5k, we got back to the house, where we made Bloody Mary’s, Brian got to playing the Annual Four Lakes flag football game, and the rest of us cooked. The Kochevar’s joined us for the fun and the girls had a ball playing with their cousins. All the Cousins – loving that tablecloth! The B to the Tizzle nailed the turkey – it was epic! My mom made this stuffing and it was to die for. This green bean casserole is by far the most amazing I think I’ve ever had. I will definitely do that again! Needless to say we were pretty exhausted by the time Saturday came around, but there is no rest for the wicked. We carted Piper to swim, spent the day cleaning, & spent the evening at The Doman’s. It was a stellar relaxing night with Grandpa Peter and Grandma Maureen. Sunday was our day to relax and relax we did. Breathe. And she woke me up this morning at about the exact same time she was born two years ago, right around 5 am! It was okay today because it’s her day and we got some extra special cuddle time in Ellie’s bed while I tried [and failed] to get her to go back to sleep with me. 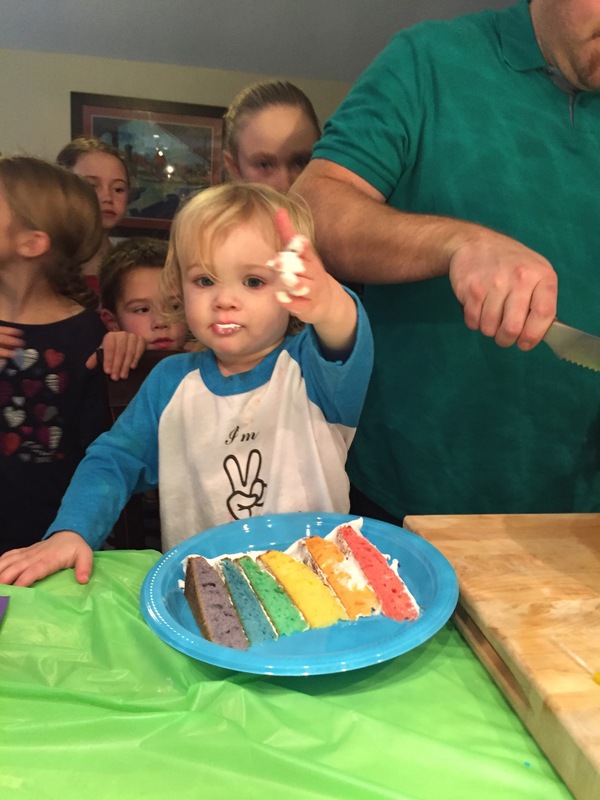 Her party was yesterday and we did a rainbow theme – several pics are below. 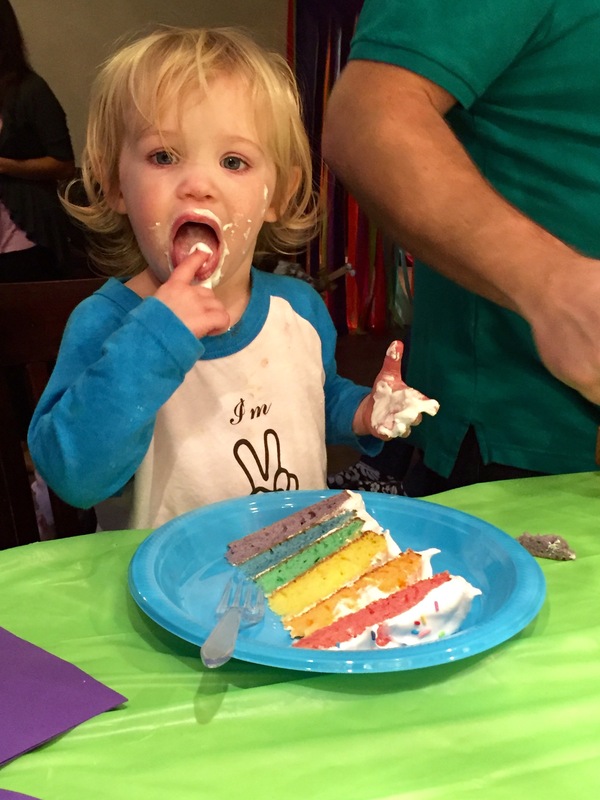 She’s not a shy one, Piper G. She was incredibly excited when she saw the cake coming her way and glowed when everyone sang to her. 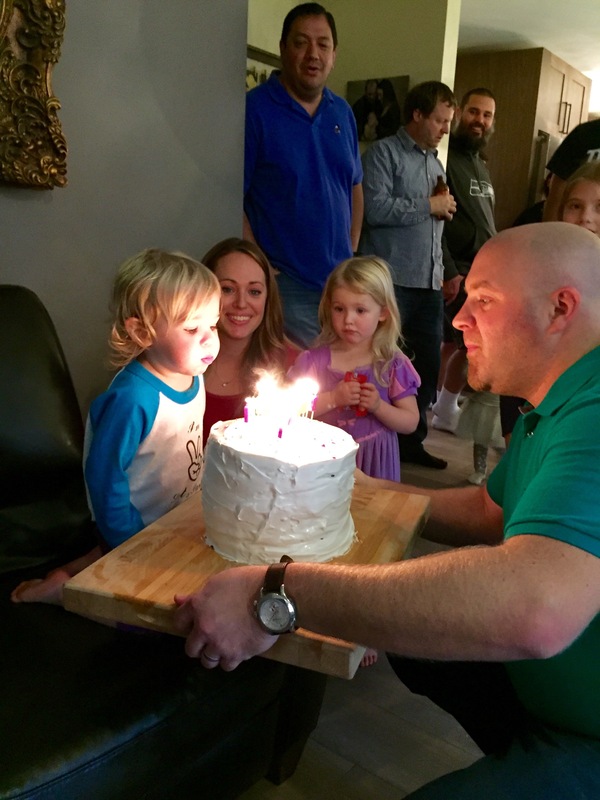 She blew the candles out with a little of daddy’s help and when everyone clapped, she clapped too. 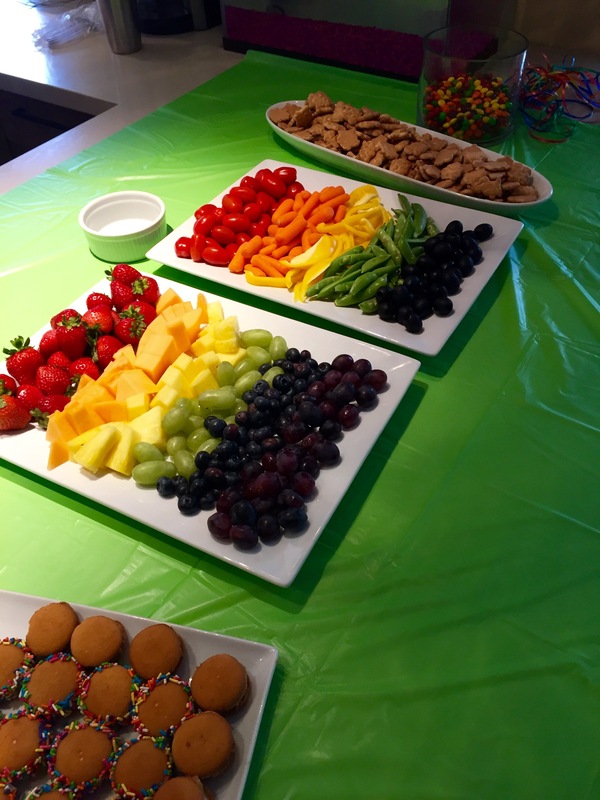 Having parties like this always fills my heart with gratitude. 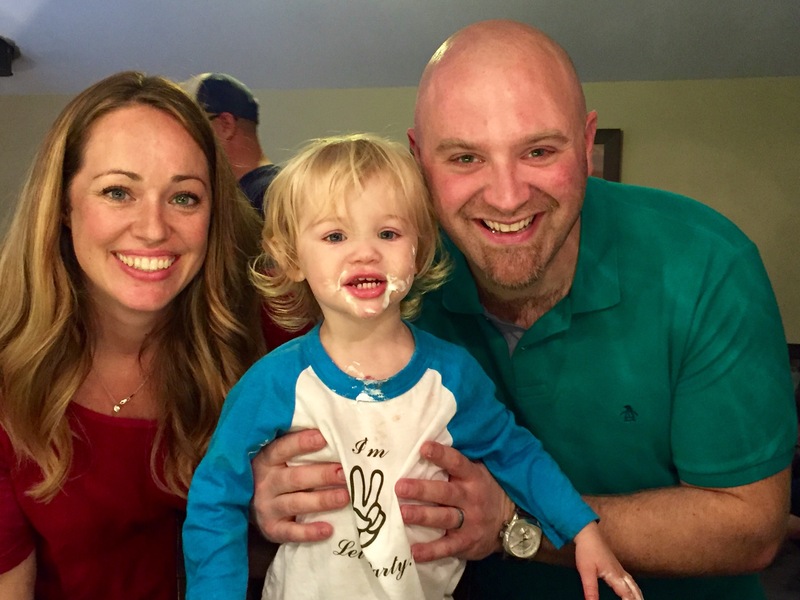 To see all the family and friends come together to celebrate someone’s birth is so meaningful. After everyone left and we rested for a bit, Piper opened her presents. It was so sweet to see how excited she was with every single one. If it was clothes, she wanted to try them on right away and literally peeled her existing clothes off every time. She put her backpack on right away. And every toy we opened she wanted to play with immediately. We read two of the new books last night and there are more on the schedule for tonight. I can’t thank our family and friends enough for their generosity – we feel VERY blessed. 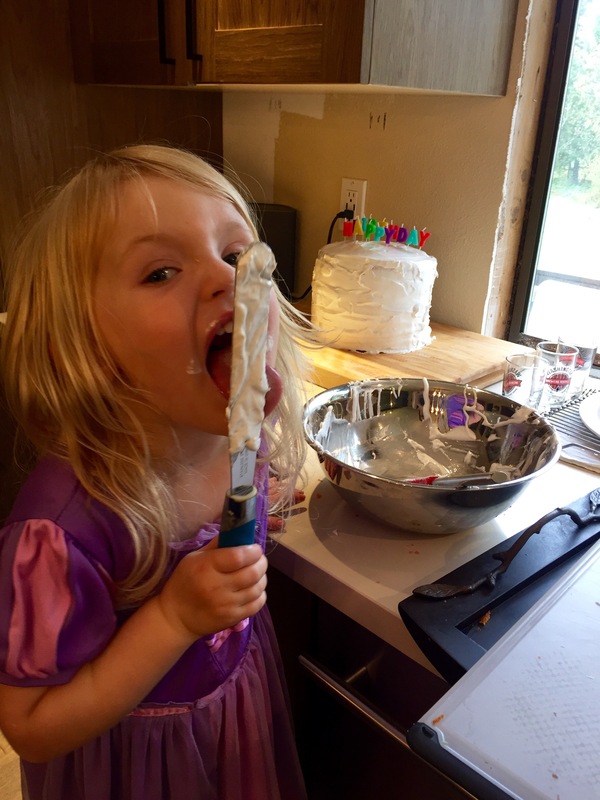 I’ve also posted the icing recipe below, courtesy of my sister-in-law Heather-Jo, as several people asked about it. 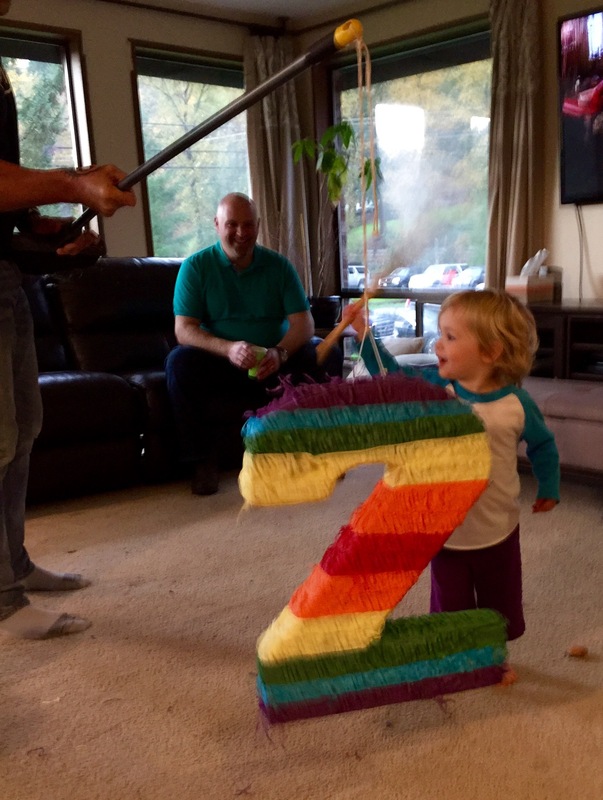 Piñata fun. I don’t know whether I like watching her hit it or try to say it more. The tutu lasted about 4 seconds. 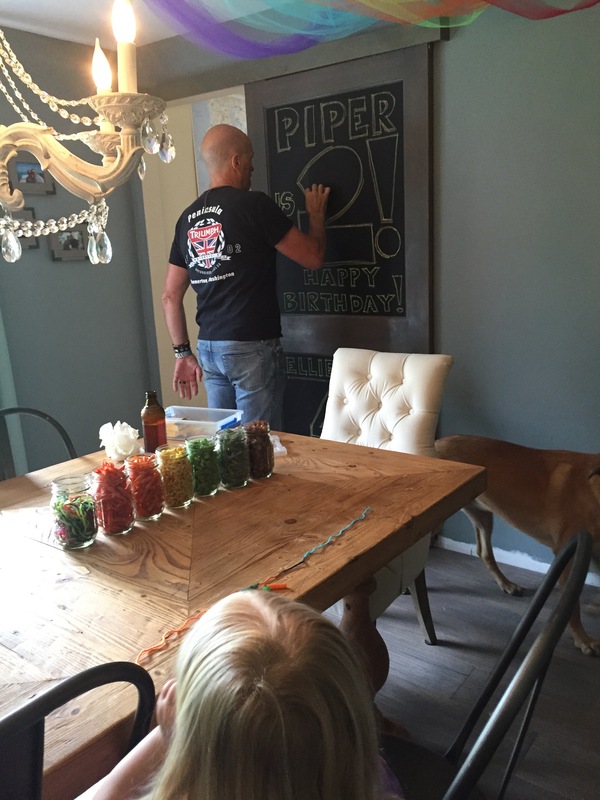 Ellie making necklaces with died pasta while Grandy decorates the blackboard. 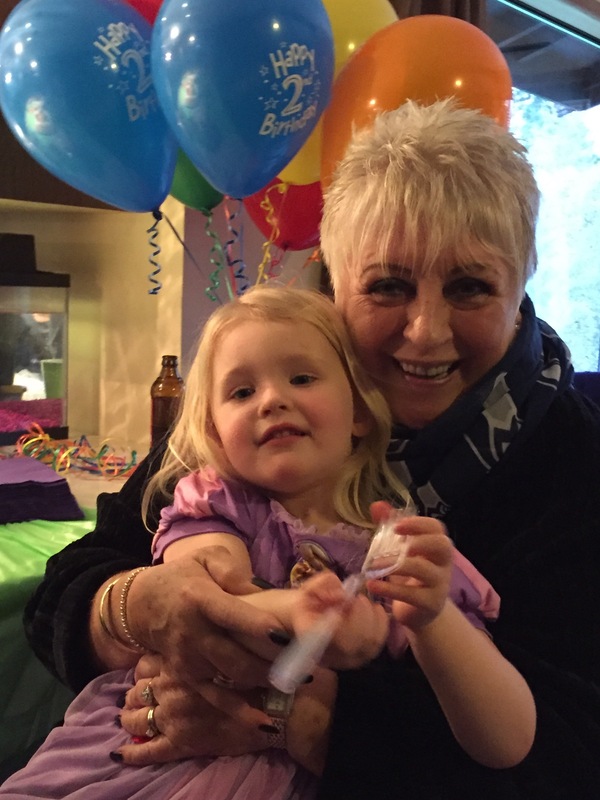 Ellie and Nana waiting for CAKE! Beat with mixer for 1 minute. Then put on top of the bottom double-broiler pan with water boiling in it. Make sure the water does not touch the bottom of the top double-broiler pan. Beat with mixer for another 7 minutes. At the end, beat in the vanilla. 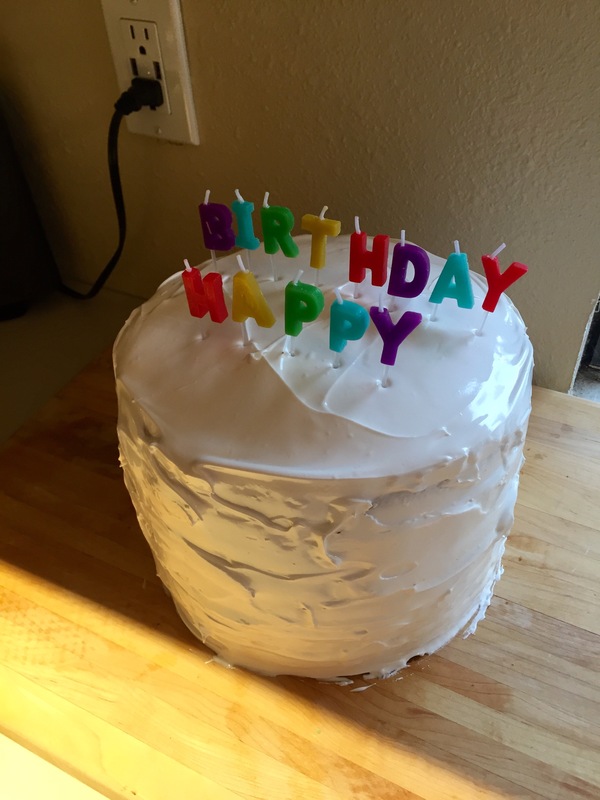 If the icing isn’t think enough, beat longer and faster until it reaches the consistency you’d like. Frost your cake before the icing cools.